Looking to add a new wow-factor in your home? 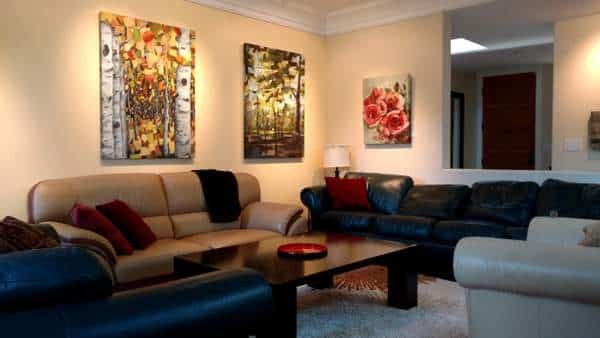 The right piece of original art is guaranteed to transform your space in an instant, whatever your style. If you want to see it for yourself, you have the option to Try Before You Buy. If you live in the Silicon Valley area, you are welcome to take one (or 2 or 3) of my paintings to your home to try out before you make a decision. The process is simple: You select the painting(s), and I’ll bring them to your home. There, we can hold them up and try them on your walls. If you’d like to purchase one or more, I’ll hang them for you and provide you with a receipt and certificate of authenticity. Or, you can live with them for a few days before deciding. If you prefer, you are welcome to come for a studio visit. You may take some paintings home to try before you buy, or I can deliver them to your home. If the paintings don’t work for you, no worries. I’ll be glad you tried them. We can discuss a possible commission or stay in touch on what you’re looking for. To get that wow-factor, try before you buy!